Recipe kindly provided by Richard Arakelian, National Executive Chef for the Corporate Services Division of Sodexho Corporate Services. For Pineapple Pico de Gallo: Combine all ingredients. Cover and chill for at least 1/2 hour. For Turkey Burgers: Combine chili powder and cumin. Place frozen turkey burgers on preheated 350°F (175°C) grill. Season with 1/2 teaspoon chili/cumin mixture. When "puddles of juice" form on the surface (about 3 minutes), turn burgers. Sprinkle surface with another 1/2 teaspoon chili/cumin mixture. To Grill: Grill for 3 to 5 more minutes on second side or until the internal temperature reaches 165°F (73.8°C). Turn burgers one more time to sear surface. To Broil: Broil frozen turkey burgers in a preheated broiler, 4-inches from the heat source, for 4 to 6 minutes per side or until the internal temperature reaches 165°F (73.8°C). 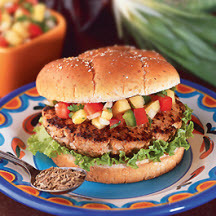 To Assemble: On base of roll, layer 1 lettuce leaf, cooked turkey burger and top with Pineapple Pico de Gallo. Place top of roll on sandwich and serve. Recipe and photograph courtesy of National Turkey Federation.